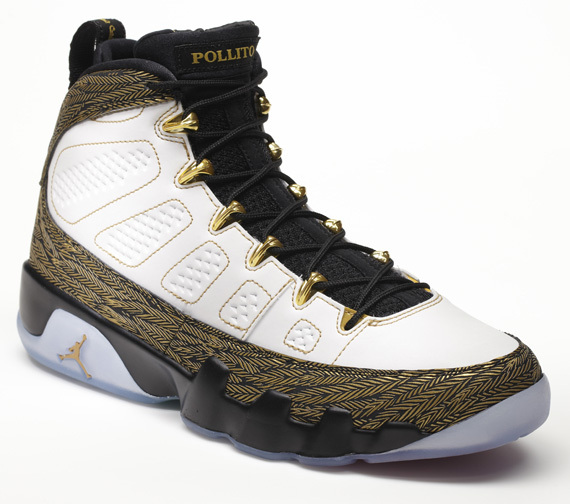 The Air Jordan 9 Doernbecher was created and designed by Oswaldo Jiminez, a patient in the Doernbecher Hospital. His vision of the Air Jordan 9 features a white leather upper with heavy accents of black and gold throughout. Equipped with a feather-like design on the mudguard, his lucky number 17 on the heel tab, and "Pollito" on the front which means "Little Chicken" One of the more subtle DB colorways, you could say the saying, "Less is More" is fitting.